Birthdays are a big deal — those special days in the year when we celebrate our favorite people for making another trip around the sun. That’s a huge! And adding a personal birthday message in a birthday greeting card for someone is an awesome way to make them feel amazing on their special day. It’s funny how you never realize just how much your little bit of extra effort is worth until you hear the person who received your card tell you what a surprise it was and how happy it made them. So don’t let negative thoughts of not knowing what to say in a birthday card ever stand in the way of your follow-through. Here’s a tip: your message doesn’t have to be lengthy; just sincere. Check out these ideas from our card experts that will help get your thought-confetti flying. I hope your celebration gives you many happy memories! Wherever the year ahead takes you, I hope it’s happy. The day is all yours — have fun! Thinking of you on your birthday and wishing you everything happy. Today, the flowers are bloomier, the sun is sunnier, and life is awesomer – all because it’s your birthday! Hope all your birthday wishes come true! It’s your special day — get out there and celebrate! Wishing you the biggest slice of happy today. Hope your birthday is as special as you are. Wishing you all the happiness someone as nice as you deserves. If there’s anyone who should have a really perfect day — it’s you. The world is so lucky to have you in it — here’s to a wonderful year ahead! Your birthday is the perfect time to remind you what a wonderful person you are. You get more amazing every year. Hope your birthday is, too! You’re one of my most favorite people to celebrate. Happy, happy day to you! Can’t think of anyone else that is more deserving of an incredibly-happy day. How do you keep getting older but looking younger? Just one of the many amazing things about you! If you’re close with the person you’re sending your card to, try going a little deeper. Think about what they mean to you, what they’ve done for you, or your favorite memory of times you’ve shared together. These specific thoughts, emotions, and memories are what make each relationship unique. One of the best parts of our friendship is celebrating you. You’re the best! Wish I could be with you to celebrate like we did last year. I’ll be thinking of you and hoping your day is every bit as special as you are. If it were up to me, your wishes would all come true. Have the best birthday ever. Hope you know what a gift you are to the world (and to me). I hope all the goodness you give away comes right back to you in the year ahead. and how much you’re loved for the amazing person you are. I’m so thankful for the great memories and moments we’ve shared, and I look forward to so many more. Have a wonderful birthday. You do so much for so many people, so just let the world come to you today. Relax and enjoy! Thanks for always being there and making life fun. Wish big today! Wish we could see each more, but I hope you know how much you mean to me. Sending you big hugs for your birthday! This used to be just an ordinary day…until you came along and made it awesome! You’re not getting older; you’re just getting a little closer to the end. Happy Birthday! You’re bound to have a Happy Birthday — it’s in the cards! (Especially this one.) Have a great day! Aging is mandatory — adulting is optional. Let go and enjoy your day! So glad you’re in the world. Thanks for that whole “being born” thing. It’s your birthday – TREAT YO’ SELF! You’re how old? Sounds like fake news to me. There’s something really special about your birthday…and I’m pretty sure it’s you. Most things don’t get better with age. Except you. You can never go wrong with simply jotting down a line or two about the person or telling them you hope they enjoy their day. 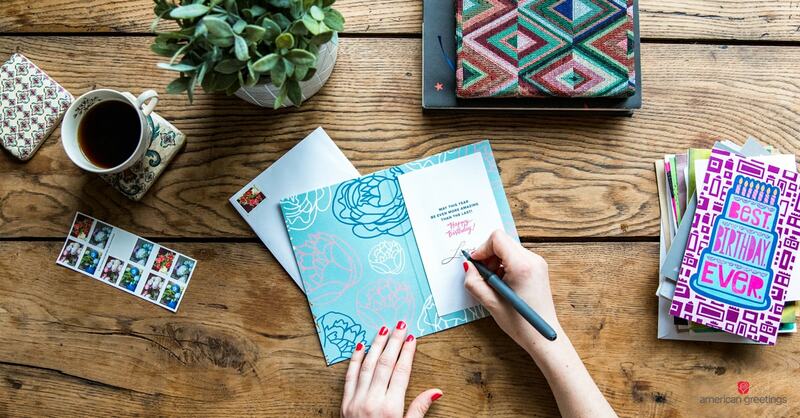 It’s so much more meaningful to someone than just seeing a name scrawled at the bottom, and now that you’ve got some ideas in your back pocket, your birthday card is no doubt going to make them feel amazing. Liza McNamara is an American Greetings senior writer/editor with over 15 years of experience in the greeting card industry. Her Old English Sheepdogs are the loves of her life, and they enjoy getting greeting cards, too, as long as they’re edible. (Yes, there is such a thing! And her pups think they’re delicious.